One of the bedrock principles of what I do as a teacher is to proudly acknowledge that I, generally speaking, have no idea what the children are learning on any given day and, honestly, any teacher who tells you she does is mistaken. This week, we've been playing with our fire fighter stuff. We probably have 15 fire trucks which we've acquired over the years. Some of those trucks are much more prized than the others. 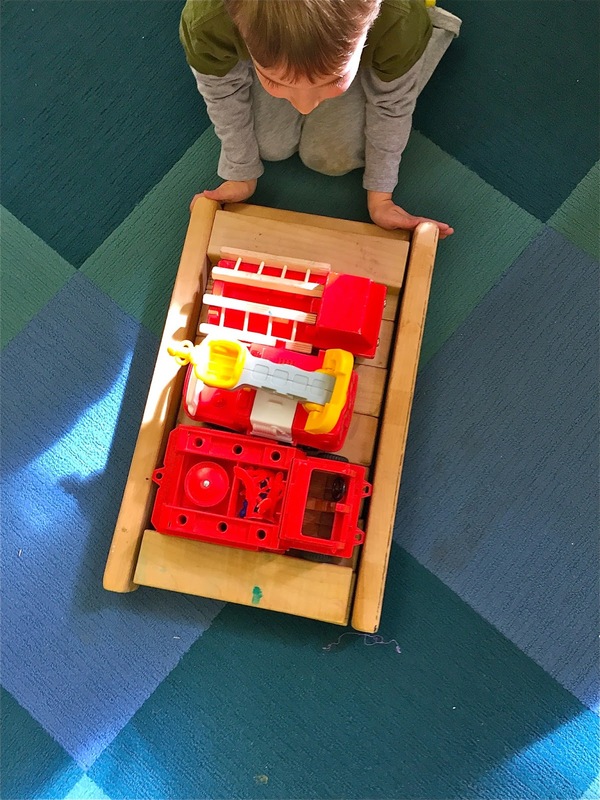 Each session, especially with our older kids, begins in a sort of competitive race to see who can "get" which truck. 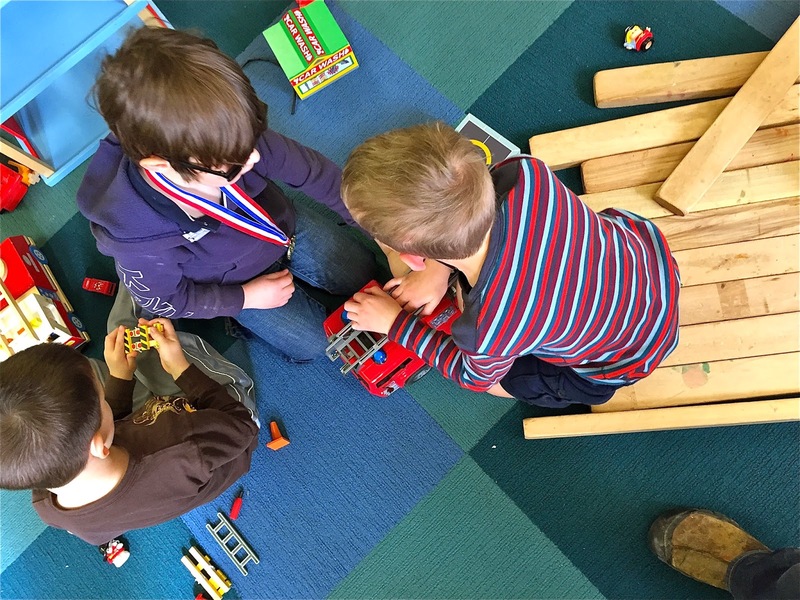 There is a lot of squabbling amongst the younger kids, which requires a degree of adult support, but the older kids, who are already well-experienced in the realities of sharing limited resources generally work it out in a matter of minutes, starting with quick grabs, then making agreements about who's "next" with any given prized object. What I do know is that they are learning because what we are primarily about is building community which is the environment in which humans have evolved to learn. 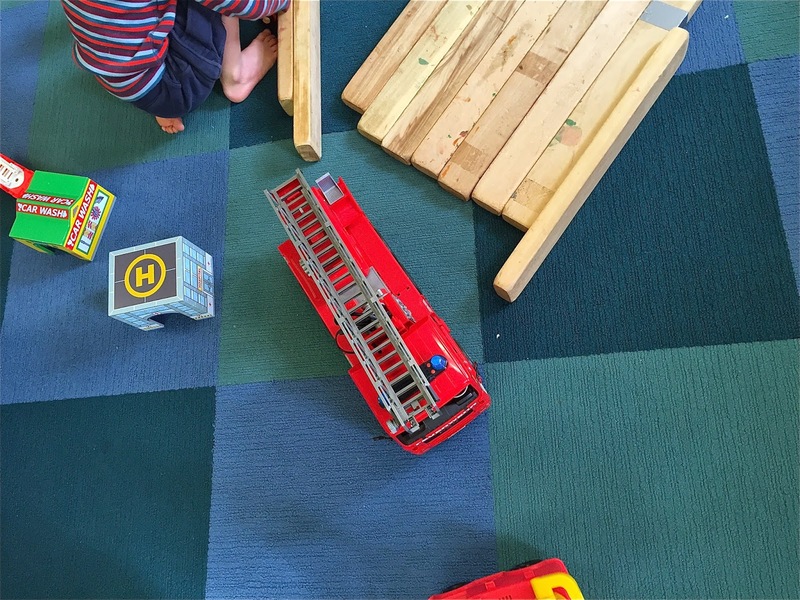 After several minutes of parallel play, the kids begin to exhaust the possibilities of simply driving one truck, alone, around the rug. 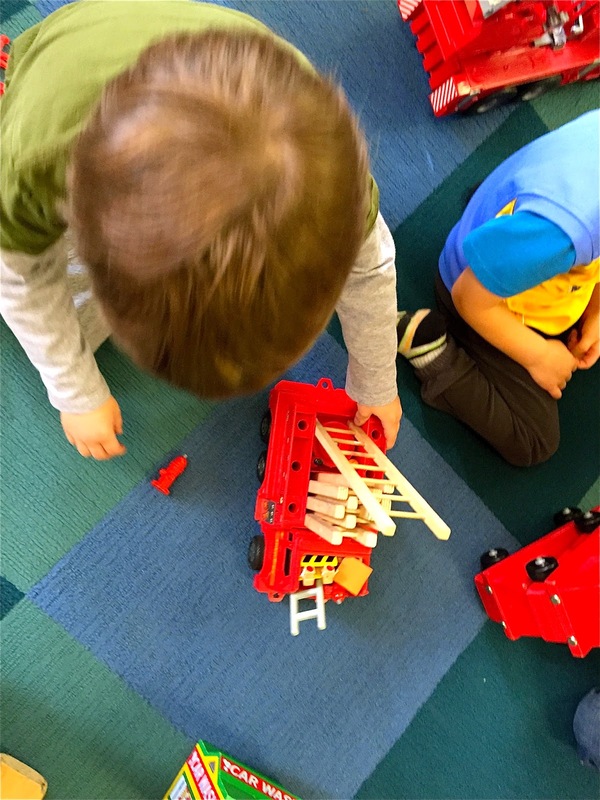 The first "invitation" to cooperative play yesterday was when one boy (and they were all boys at the start) had the idea of putting trucks on top of the fire station. Soon others joined him and they enjoyed some jokes about flying fire trucks and extra high ladders, jostling one another in a self-created tight space. 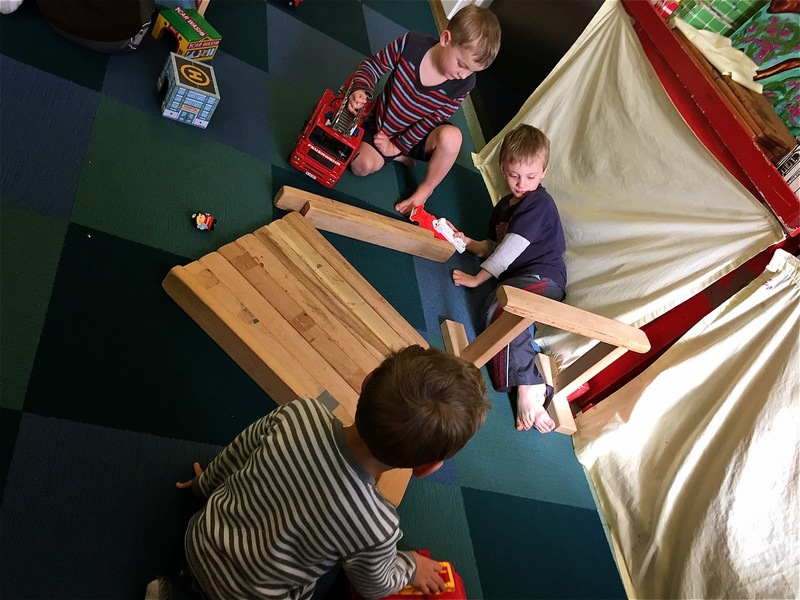 For tens of thousands of years, since the dawn of hunter-gatherer mankind, going back as far as anthropologists have been able to look, free play within the context of community has been the cornerstone of education. 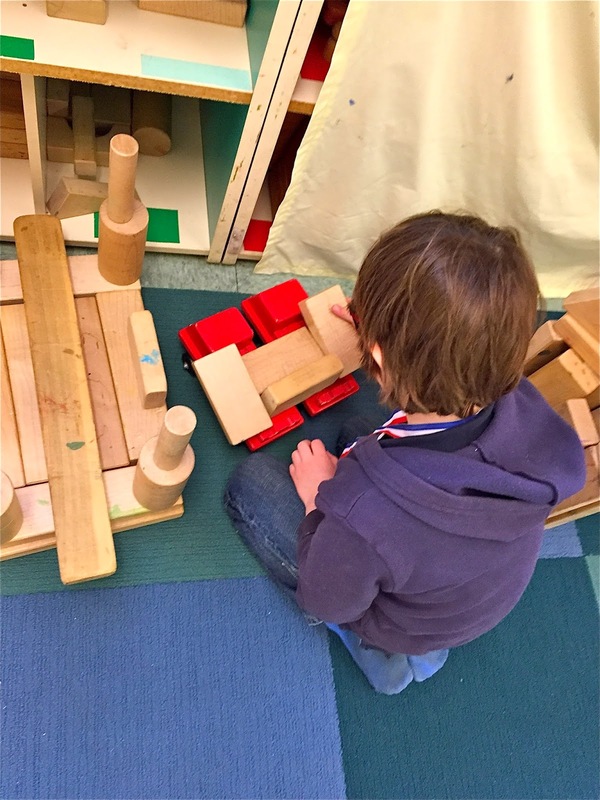 This idea then lead to another group forming around a platform of blocks a classmate had built on his own, then abandoned. 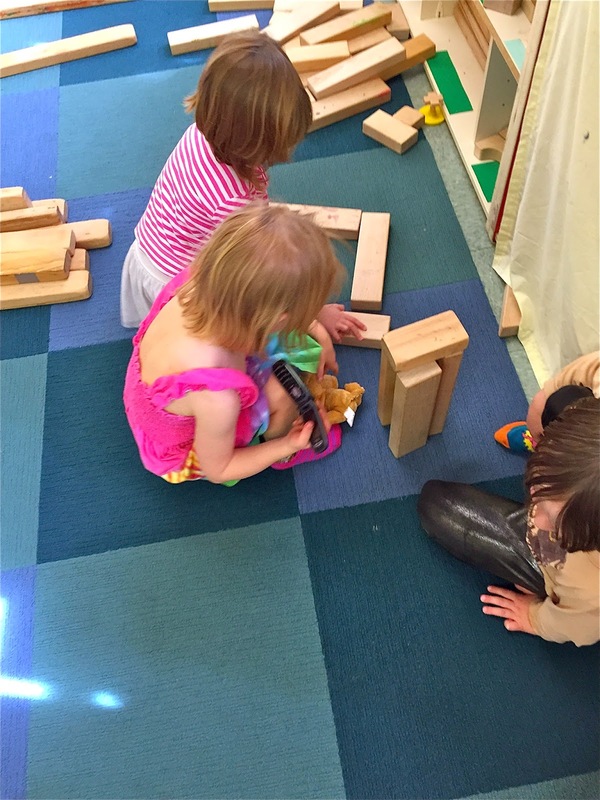 Now our independent players had formed into two cooperative play groups, with a few others continuing to explore on their own. What we do now, with adults dictating what and when children should learn, is so recent that it's barely a blip on a timeline of human history. Some children remained focused on getting their turn with prized trucks, while others settled for the lower drama of "lesser" trucks, some even declaring them their "favorites." This guy collected three unwanted trucks and built them a boat which he pushed around the rug. Before long, he had friends who wanted a turn. One guy collected the four bottom-of-the-barrel trucks and stacked them, first as a "double decker." When he showed me that he had extended his original idea into a "four decker." I said the word "quadruple" and he repeated it several times. 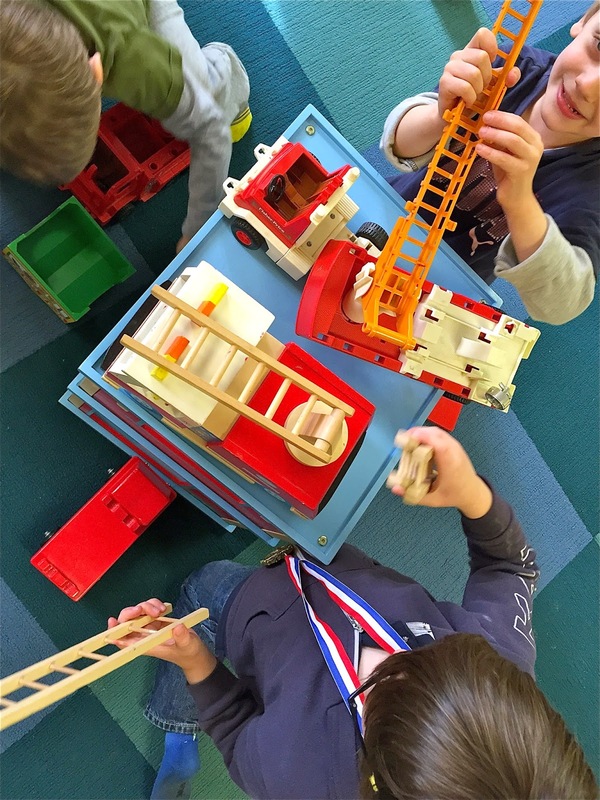 Some of the kids chose to concentrate on playing with the ladders rather than the trucks. Sure, sometimes I can make a guess about what children are learning by observing their behaviors. Sometimes they come right out and tell me what they've learned. 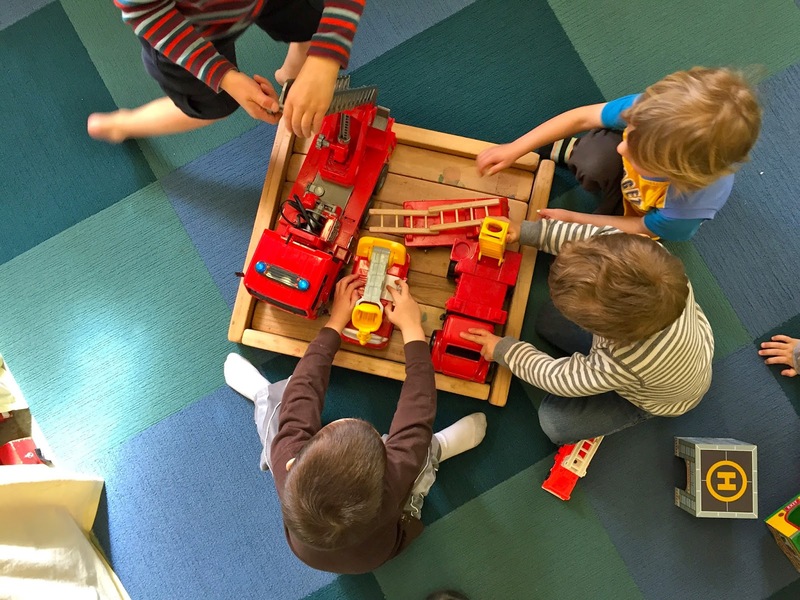 One boy built a "car wash for fire trucks," then invited his friends to play with it. Before long, most of the boys had formed into a caravan of trucks going around and around the space with the car wash as the anchor to their game. There appear to be many of us who think we can get at the answer by asking children questions, lots of questions, as is done with testing, but what we primarily learn from that is how individual kids answer your questions, or if they can answer your questions in a teacher approved manner, not what they have actually learned. At some point, I noticed that the most coveted truck of all was sitting completely unclaimed. After several minutes, two boys spied it at once and their hands were on it simultaneously. As the conflict erupted, I stepped away to give them the space to work it out. It began civilly enough, but things began to escalate as they got stuck in a back-and-forth "I had it first!" debate. As the tugging became more assertive, I knelt down and put my hand on the truck. I asked, "What's happening?" then proceeded to simply repeat what each boy said as they took turns making their case. After a couple minutes, a boy sitting nearby said, "Maybe you could both play with it." It turned out to be the right idea at the right time. "How about I play with the hose and you drive it?" The tension evaporated and I moved away again. Physical scientists have long known about the observer effect which refers to the changes that the act of observation make on a phenomenon being studied. After awhile, some girls came into the area. 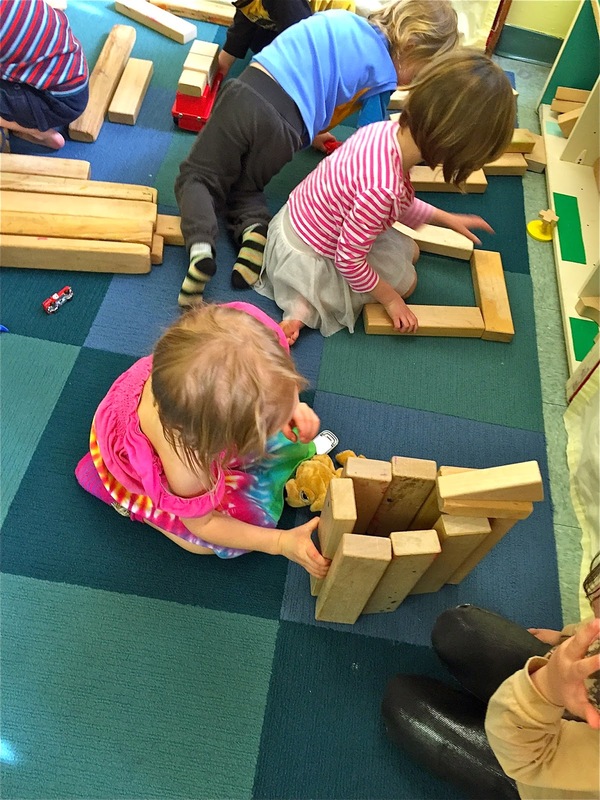 They weren't interested in the trucks: their focus was on building with the blocks. It didn't take long for the boys to find them and try to figure out how to enter into their play. 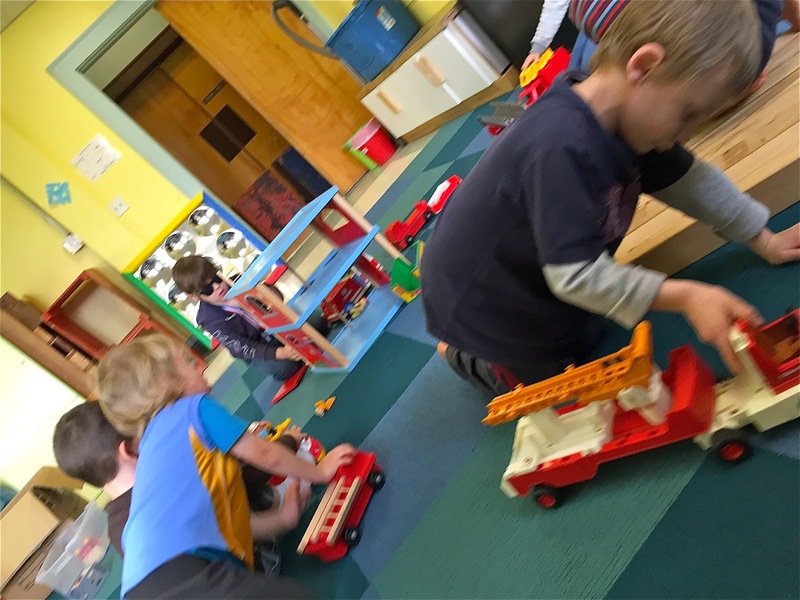 When the girls said they wanted to build by themselves, several of the guys decided to use their fire trucks to deliver blocks to them. What had started as a competition over fire trucks had by now evolved into a game of giving and "thank yous," a game of community. Psychologists know of the observer-expectancy effect whereby a researcher's cognitive biases cause them to unconsciously alter or misinterpret the results. It is simply impossible for anyone but the one doing the learning to know what they have learned unless they tell us of their own volition. 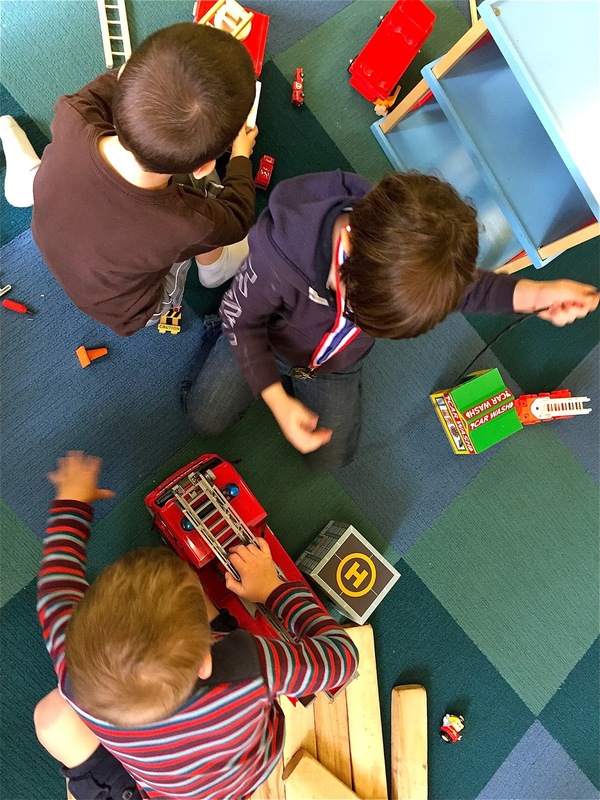 As a preschool teacher, I am satisfied if the children are engaged in self-selected activity. When that is true, I know that the children are learning. My job is to get the environment ready, then stay out of the way, intervening only when it is crystal clear they need me. That's when I know they are learning, because they are freely playing within the context of community.